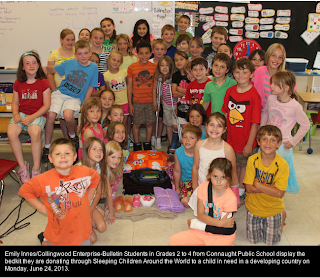 COLLINGWOOD – Students from a local elementary school turned pennies into a gift for a child in need in a developing country. 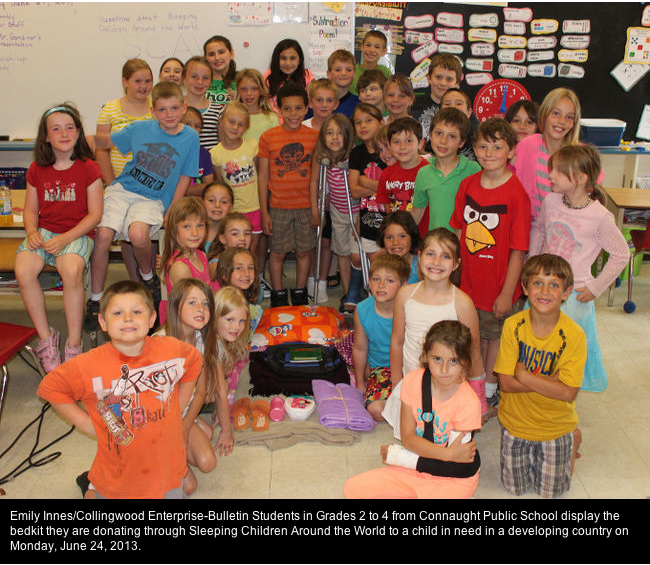 Students at Connaught Public School held a penny drive to raise funds to purchase a bedkit from the not-for-profit charity Sleeping Children Around the World. Albert Gardiner, a local volunteer with SCAW, gave a presentation to students in Grades 2 to 4 to show them the difference their pennies are making. Gardiner laid out the contents of the bedkit: a mat or mattress, a pillow, sheets, a blanket, a mosquito net, clothes, a towel and school supplies. “These things we take for granted that we have them every day of the week, but they have never seen these things,” said Gardiner. The bag costs $35 and is assembled in the country where they are distributed. He said it is a rewarding experience to bring the kits to the children because they are so grateful. The students watched a short video about the history of SCAW. Founder Murray Dryden travelled east from Manitoba during the Great Depression in the 1930s and had to endure many nights without food or a bed and vowed to one day to help others who didn’t have a place to sleep. Dryden and his wife, Margaret, began the charity in 1970 and after he died, he donated his home to be used for the organization, therefore 100% of donations go straight to the bedkits. SCAW has raised more than $23 million to provide bedkits for children in 33 countries. They have delivered more than a million kits. Connaught has been supporting the charity for more than 12 years and has donated about 500 kits. One student after the presentation said he wished he could give $20 to SCAW.